Carbon fiber camera monopod, lightweight and convenient to carry around. Quick lock system for length adjustment, securely lock the unipod to better protect your cameras. 5-section monopod, the folded length is 45cm, the maximum extended length can reach up to 165cm, space saving and easy to carry. 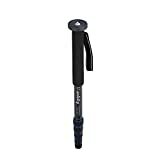 The maximum diameter of the monopod is 25mm, maximum weight capacity can reach up to 10kg, also can be used as a hiking stick when necessary. The camera plate and 1/4 to 3/8 inch connecting screw allow you to install camera or other camera mount adapter such as ball head directly. 5-section lightweight camera monopod, made of carbon fiber, extended length from about 45cm to 165cm. The camera plate and 1/4″ to 3/8″ connecting screw allow you to install camera or other camera mount adapter such as ball head directly. With a 3/8″ screw hole at the bottom allows you to install a mini tripod. The foam grips offer superior comfort to the users. A carrying bag and a wrist strap for better using. Can also be used as a walking stick when necessary. Designed for DSLR camera, a great partner for photographer. Manual measurement will cause slight measurement error. This entry was posted in Discount Photography and tagged 5Section, Andoer®, Camera, Canon, Carbon, DSLR, Elders, Fiber, Monopod, Nikon, Olympus, Pentax, Stickfor, Telescopic, Unipod, Walking by Ball Photo. Bookmark the permalink.